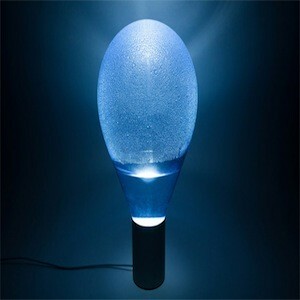 A balloon-shaped lamp that uses water condensation to diffuse light and create a calming blue atmosphere has won an award at the 2014 Belgian Interieur Biennale. The Atmos lamp from designer Arturo Erbsman consists of an aluminium base that holds a light source, covered by a blue, blown-glass bubble. Inside the glass bulb is small pool of water. When turned on, the heat from the light source causes the water to evaporate and form droplets of condensation on the inside of the glass. As time passes, the water droplets merge together, become heavier, and eventually run down the surface, back into the pool of liquid. The created effect is a diffused and dewy illumination. Atmos was on show alongside other winners of the Interieur Award, all of which were acknowledged for demonstrating the impact of new technologies and materials on product design.